Today’s competitive world highlights the vitality of innovative nomenclature of domain names that enables businesses of all silhouettes to reach out their target audience with a stanching brand presence. Right from the SMEs to giant IT enterprises, we all are accustomed with generic top-level domains (gTLDs) such as .com, .net, and .org.gTLD’s is a two to three character Internet domain name extension managed by either the sponsoring organization or by the Internet Corporation for Assigned Names and Numbers (ICANN) in the Domain Name System (DNS). These customized top level domains play a focal role in effective branding ensures better returns on investment and control how their brand appears online. This type of domain name is used by a particular set of businesses. However, this is not stringently followed, since there is no clarity that who all uses them and for what purpose these domain names are registered for. The most common types of gTLD’s are .com, .net, .info, .net. Among all, .com is one of the most popular domain names. Such country top-level domains depict particular countries including independent territories with two letters Internet domain name extension. Both creation and delegation of these ccTLDs are managed by Internet Assignment Numbers Authority (IANA). How new gTLDs are Surpassing the Generic TLDs? 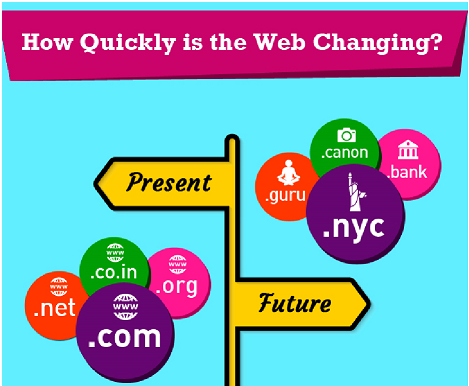 The new gTLDs are an extended version of the most popular top-level domains (TLDs) that includes .com and.org. It helps businesses to opt for a domain name that goes in sync with their industry, so that they can attract more users to their website and gain maximum brand visibility. Businesses having their online presence are well aware of the significance of gaining robust online visibility. Generic TLDs allow companies to choose a domain name that best represents their business. There is no denying the fact that we all are accustomed to gTLDs, however, a report byICANN states that around 1300 new names will become available for end-users in the approaching few years owing to its robust attributes. It has made a paradigm shift in the Internet addresses. If reports are to be believed new top-level domains are reaching landmarks at a much quicker pace than expected enabling organizations. - Scope of Opportunity: Few years back, entrepreneurshave only fewer options (21 gTLDs) to select from. However, the inception of new gTLDs has provided endlesschoices to the users, so that they select the desired domain name for their business. For e.g. - .Camera, .Car, .Photos, etc. - Foster Healthy Competition: Increasing number of new gTLDs will built a healthy competition in the industry while keeping a check on adequate Internet security and business sustainability. - Brand Visibility: Right domain name guarantees unparalleled online presence. New gTLDs will help you register a catchy, short and easy to pronounce domain name – that can stick to your user’s mind. - Mass Reach: New gTLDs allow your business to target right users, which further helps you to establish your business as a brand. For e.g., you can choose .Car for your Car business – this in turn, enables you to focus on potential consumers. To conclude, new gTLDs resonate with your business and helps in differentiating your business from your counterparts, giving you new vistas of opportunity to thrive in this digital space.